Cloth diapers are making a come-back as an economical, environmental, and healthy alternative to disposable diapers. Today’s cloth diapers come with features like super-absorbent linings, Velcro or snaps for easy fastening, and more waterproof covers. They are as convenient to use as disposables, but can save you money while also saving your baby’s bottom and saving our environment. 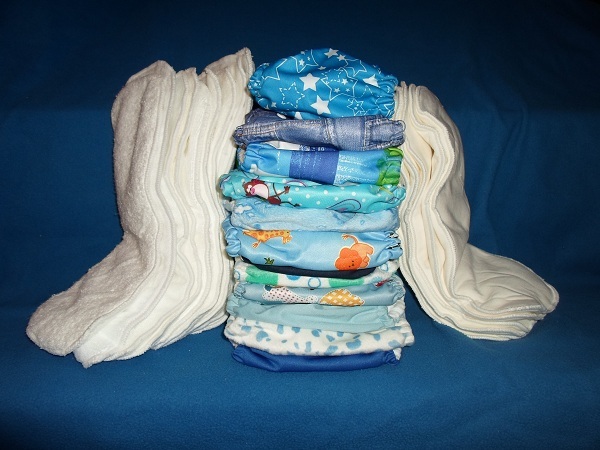 Cloth diapers vary in price, from $10 up to $25 per diaper, depending on the brand. Two to three dozen diapers should keep a baby in clean diapers for about three days. Two dozen cloth diapers at $25 a diaper cost $600—which, compared to disposable diapers, pay themselves off in under a year. With proper care, cloth diapers can be used for several children and also have resale value. Cloth Diaper Geek offers a cloth diaper calculator, where you can input your diapering expenses and more easily compare cloth vs. disposable for your child. Obviously, local expenses and how many diapers your baby wears and other factors affect how much money you’ll save by switching to cloth. The diapers for one baby may not seem like a big deal in the garbage, but all the diapers used by babies in just the States create a big pile. “18 billion disposable diapers are thrown in landfills each year, taking as many as 500 years to decompose. Disposable diapers make up the third largest source of solid waste in landfills,” says Jane McConnell in an article in the May/June 1998 issue of Mothering Magazine. One mom who switched the cloth diapers instantly noticed that her household garbage was much smaller without the disposable diapers. Because disposable diapers are made from non-breathable plastic, they can contribute to diaper rash. My first daughter had diaper rash only when we put her in disposable diapers. When we realized that, we exclusively used cloth diapers until she was potty trained and hardly faced any diaper rash. Parents may also be tempted to change baby less frequently in disposable diapers, because disposable diapers stay dry for longer, but this means that baby is sitting in his or her own urine for longer. My first daughter hated being wet, so she cried as soon as she wet her diaper and we changed her. Later, when she was able to talk, she’d ask for a diaper change—and then potty trained around age two because she was more aware of her bodily functions. Disposable diapers also contain chemicals that should cause parents concern. One chemical used in manufacturing disposables is dioxin, “which in various forms has been shown to cause cancer, birth defects, liver damage, and skin diseases” (McConnell). The absorbent material in the diapers contain sodium polyacrylate, which can cause severe skin infections and is the “same substance that was removed from tampons in 1985 because of its link to toxic shock syndrome” (McConnell). Cloth diapers offer a more chemical-free alternative for concerned parents. Consider Cloth Diapering–More Information on Cloth Diapers! If you are interested in switching to cloth diapers for your baby, there is a lot of information available for you. Look at cloth diaper manufacturer’s websites for specific information about caring for the diapers. Just Add Cloth is a blog dedicated to cloth diapers, with how to tips, cloth diaper reviews, and more. 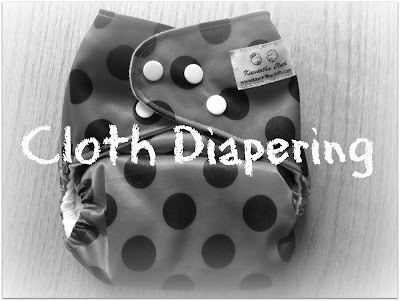 To talk with other moms about what cloth diapers have worked for them, check out the diapering forum on Mothering.com. Have you ever considered cloth diapering? Thank-you to Bonnie Way for contributing, she is a stay-at-home mom and freelance writer who blogs as The Koala Bear Writer. Bonnie Way is a stay-at-home mom and freelance writer who blogs as The Koala Bear Writer. She has cloth diapered both of her daughters and was actually cloth diapered herself as a baby. When she’s not blogging or changing diapers, she enjoys reading, baking, and rock climbing. Previous Post: « LittleEcoFootPrint: Discovering and Trying New & Safe Eco-Friendly Products for You and Baby Each Month! We tried cloth, I wanted to be a cloth-user/breast-feeder/etc..but with being stressed out new parents, having a kindergartner, post-partum depression, etc etc it soooo didn't last long. Luckily my girls never had issues with disposies. I use cloth with my son up until 10 months. Sadly he's leaking everywhere and I had to stop. I have stripped, added more layers and everything I can. I'm frustrate because I love cloth diapers! I've definitely considered it for cost and the environment but I have enough trouble changing stinky diapers that I just throw away, never mind cleaning ones I have to keep! Great post! My sister is starting cloth diapering with her soon-to-be-born baby and I can't wait to follow along with the process. I wish I had known more about it when my DD was in diapers! You set some pretty good arguments for cloth diaperijg. I did actually cloth diaper my children. Great points. I think what would keep me from using cloth diapers is the complaints of leaking that I hear from a number of my friends who have tried it. There are some great companies coming out with new products, though, and hopefully when it's my time, this won't be as common of a problem anymore!